Comprehensive Eye Examination — Spectrum Eye Care, Inc. Many systemic conditions and medications can directly affect your eyes and vision including diabetes mellitus, hypertension, autoimmune disorders, and more. This is a measurement of the smallest letters you can read on an eye chart at a specific distance and is performed one eye at a time. By shining light in your eyes we can see how quickly the pupil responds to light, this allows us to see how the eyes are communicating with the brain. This test evaluates how the eye is functioning and communicating to the visual cortex in the brain. Decreased peripheral vision can be symptom of diseases of the optic nerve such as glaucoma, neurological problems or retinal diseases. Also known as ocular motility, is a test to determine of how well your extraocular muscles are working. This will help determine whether or not you need corrective lenses such as glasses or contact lenses. When an eyeball is too short or too long or the cornea has too much or too little curvature it will result in light not being in perfect focus on the retina causing blurry vision. While measurements of the eye give doctors a starting point for your prescription, seeing also involves your brain so patients input on “which is better 1 or 2” can help determine the best prescription for your eyes and brain to see clear and comfortably. This test typically involves a yellow-green drop and a blue light. The measure of intraocular pressure helps determine if you are at an increased risk for developing glaucoma. A special microscope that allows for evaluation of the eyelids, conjunctiva, cornea, tear film, iris, lens, and anterior chamber. This instrument allows us to look for signs of dry eye, allergies, blepharitis, cataracts, etc. Dilating drops increase the size of the pupil and allow your doctor to evaluate the health of the retina and optic nerve. Without dilation only a limited portion of the retina can be seen. The drops will temporarily make you more light sensitive and affect your focusing system which can cause blurry near vision for a few hours. Arrange transportation for your appointment if you are concerned about driving after dilation. A thorough examination of the retina, optic nerve and blood vessels can help detect diseases like glaucoma, macular degeneration, diabetic retinopathy, hypertension and more. Additional testing such as optical coherence tomography (OCT), fundus photos, and visual fields can aid in diagnosis of ocular and neurological diseases . Early detection is often crucial for better visual outcomes. 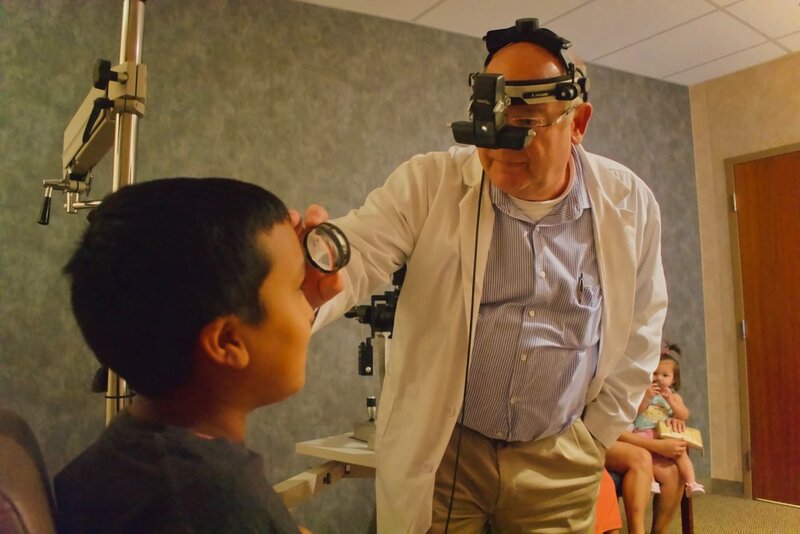 Bring your child for a comprehensive eye examination before starting kindergarten to make sure his or her eyes are ready for all the learning opportunities they are about to encounter. Every 1-2 years throughout school age, while children are growing so are their eyes and this can cause changes to their prescription. Adults from age 18 to 60 years old, every 1-2 years. Annual eye exams after age 60 as many eye conditions have a higher incidence with increased age such as cataracts, glaucoma, and macular degeneration. Contact lens wearers need annual eye exams to ensure the contact lens are allowing enough oxygen to their cornea, not causing any irritation to the ocular surface, and to ensure proper care of your contact lens to minimize your risk for infection. Diabetics should also receive annual eye exams, sometimes they may need to be seen more frequently depending on the severity of their condition. Always follow the recommendations of your eye care professional. Click Here for more information regarding the frequency of eye exams. Over your lifetime, your eyesight goes through an extensive transformation, beginning when in your infancy, and contining throughout your childhood, your teenage years, and throughout your adulthood. Explore how your eyecare provider can assist you throughout the visual changes in your lifetime. Click here to learn about your eyesight transformation from beginning to end, or use the direct links in the timeline below.